Milk Powder Gulab Jamun is delicious milk powder and flour dumplings soaked in saffron flavoured sugar syrup. 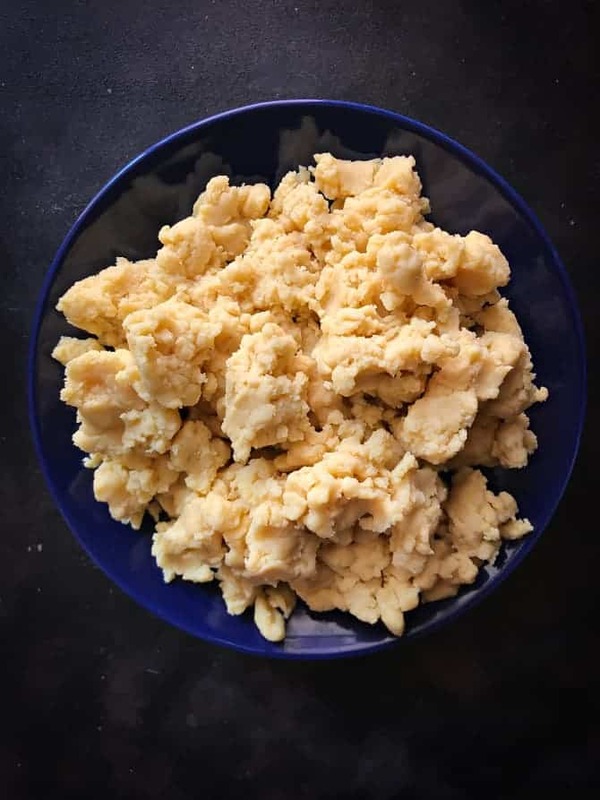 This recipe is especially for all you lovely people who do not have the access to readymade khoya. Yes, we can make khowa from milk powder and then proceed with making it into Gulab Jamuns, hence the name Milk Powder Gulab jamun. I have lately been receiving a lot of requests to make Gulab Jamun using Milk powder. 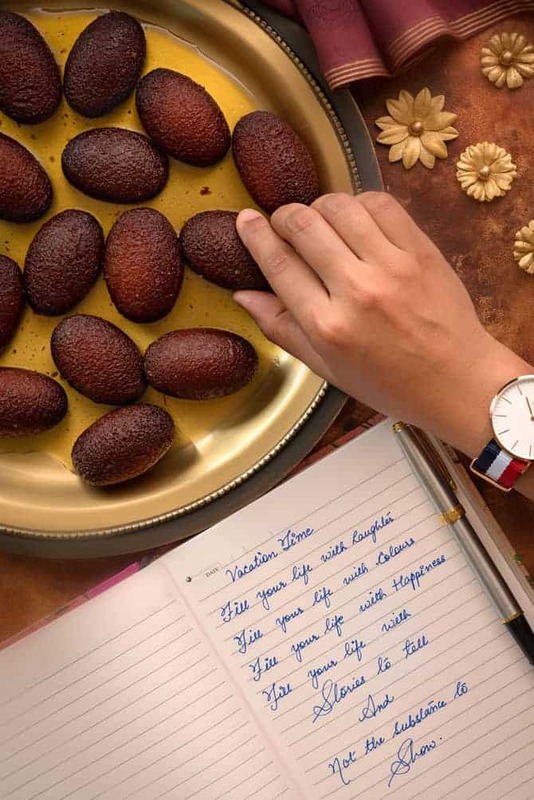 The reason being so is, the Khowa we use basically in making these Gulab Jamun are rarely found in other foreign countries except for that in India and Pakistan. Request has especially been made to me, to make this dessert by using milk powder. So, all my beautiful friends can make it themselves even if there’s no Khoa available around them. Gulab Jamun is amongst one of the most famous Indian dessert around the globe followed by Rasgulla, Gajar ka Halwa, Ras Malai, Sooji ka Halwa etc. Here, in India, Desserts are the best part of a meal and especially if it’s an Indian dessert. Cakes, Pastries and Pies are special events desserts which are not preferred regularly by most Indians instead these desi desserts are highly preferred be it just the Malai Peda or Mawa Malpua. The best part about India is, that not just divided into multiple languages but also we get variety of desserts and sweets of different flavors from every other regions which are totally different in shape, color and size from one another. Can we preserve Milk powder Gulab Jamun for long? Yes, we can preserve this Milk Powder Gulab Jamun for good long time (2 weeks) in an air tight container under refrigeration. You just have to make sure the container is clean and sealed well while refrigeration. Futhermore, when you want to enjoy, all you need is to heat it for good 30-45 seconds in a microwave and treat yourself or your family.. In fact, we can easily freeze the Milk Powder Gulab Jamun in a clean airtight container for good 4-5 months in portions. All we would need to do is, thaw it at room temparture and reheat it in microwave to enjoy. What are the alternatives of sugar syrup? 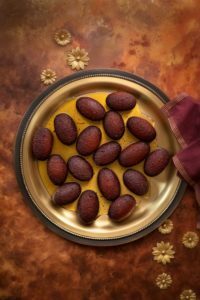 What is the difference between Kala Jamun and Gulab Jamun? I have been very frequently asked about the difference between both these Jamuns. However, they not only taste similar but sound similar. And so I thought of discussing it here. Now, in Gulab Jamun, usually we do not sfuff dryfruits and we do not make a use of Chenna/Paneer. Where as in the Kala Jamun, we make dough using paneer/chenna and adding some sugar into the dough. The dough balls are then fried deep, where the sugar caramelizes. The balls turn darker due to the caramelized sugar that directly contacts the hot oil/ghee. And this is exactly how it is then said Kaala Jamun. How to make Khoya from Milk Powder? Usually, the Khowa that we get in the dairy is made up of full fat milk. And, if you are getting full fat milk at home you can make the Khowa yourself too. First, we have to pour full cream milk into a heavy bottom pan. Then, it needs simmering for hours until the milk reduces to 1/4 and further to get thick texture and yellowish color. It is similar to that of the traditional Khowa making procedure. But, it takes really less time comparatively, when we make khowa using just milk. Here, we need to mix the milk powder into the milk (not necessarily full fat, but it is better to use)along with butter and some ghee. This will give us an accurate taste and look of the traditional Khowa. Milk Powder Gulab Jamun tastes as good as the Khowa Jamuns. I bet these Milk Powder Gulab Jamuns will never disappoint you. this is how the homemade milk powder khowa looks. Can we use this milk powder Khoya in other recipes. i.e curries or sweets and desserts? Yes, we can use this Milk Powder Khowa in all the other recipes as well. As we are making it out from milk powder, so we do need good amount of milk powder, full fat milk (can use skimmed as well, but full fat preferable)), unsalted butter, ghee. To make Sugar Syrup, I have made it of regular sugar, as it tastes best with sugar. Next, we use cardamom powder and saffron. Cardamom gives an amazing aroma and taste to the syrup. Whereas the saffron gives it a beautiful color and richness. Have you tried this “Milk Powder Gulab Jamun Recipe“? Please feed us with your ★ star ratings and comments below. You can also FOLLOW Me on FACEBOOK, INSTAGRAM and PINTEREST for more fabulous recipes and updates. This delicious Gulab Jamun made from milk powder is super delicious melt-in-mouth sweet. A detailed recipe of how to make khoya or Mawa or kova from milk powder. In a heavy bottom pan, melt butter. Add ghee, milk and mix. Bring it to a boil. Then reduce the heat to low. Gradually, add milk powder and keep stirring continuously. At any point, please do not increase the flame also do not stop stirring. Keep stirring and cook until it reaches thick khoya consistency. Once it reaches the required consistency, mixture will start leaving the pan and dries up well. This will take approx. 20 minutes. Take it off the heat. Transfer the khoa on to a big plate and allow it to cool completely. Khowa is ready to use. The above measure yields approximately 750 grams of khoa. Prepare syrup by boiling sugar, water, cardamom powder. Remove scum if any. Add saffron and boil it for another 12-15 minutes on medium flame. In a large plate or bowl, start kneading the khoa with the heels of your palm. It should be very soft. If the khowa is too dry or thick add few tablespoons of milk. I added 3 tablespoons of milk. Knead well. Add soda and maida. Mix everything well and knead it into a soft dough. Dough should be soft and lump free. Cover the dough and keep it aside for good 20 minutes. Meanwhile heat oil/ghee in kadhai or pan. Now, after resting the dough, divide it into small equal sized balls. Shape each ball into smooth round or oval shape. This time I shaped then into an Oval. Do not apply too much pressure and avoid cracks on jamuns. When the ghee/oil is hot, reduce the flame to medium low. Ghee/oil should be hot but not smoky. If the ghee/oil is too hot the jamuns will burn and remain uncooked within. Gently slide the jamuns in the oil. Firstly, jamuns will sink at bottom, after few seconds it will float on the top. Keep stirring jamuns with ladle so that they get evenly fried. Fry them till brown. Once done carefully take them out on absorbent paper and drop them in hot sugar syrup. Repeat the same for all the jamuns but do not add too many jamuns for frying at a time. Leave the Gulab Jamuns aside to allow the jamuns to soak the sugar syrup well, atleast for an hour or so before serving. I usually keep it soaked in the syrup for overnight and serve next day . Keep stirring and cook until it reaches thick khowa consistency. Once it reaches the required consistency, mixture will start leaving the pan and dries up well. This will take approx. 20 minutes. Take it off the heat. Transfer the khoa on to a big plate and allow it to cool completely. Khowa is ready to use. The above measure yields approximately 750 grams of khoa. Cover the dough and keep it aside for good 20 minutes. Meanwhile heat oil/ghee in kadhai or pan. Leave the Gulab Jamuns aside to allow the jamuns to soak the sugar syrup well, atleast for an hour or so before serving. I usually keep it soaked in the syrup for overnight and serve next day . How many Gulab Jamuns approximately the recipe makes? Looking forward to trying this recipe. I am huge fan of your blog!